Have some chicken in your fridge waiting to get cooked up, but not in the mood to roast, stir-fry, grill or stuff? 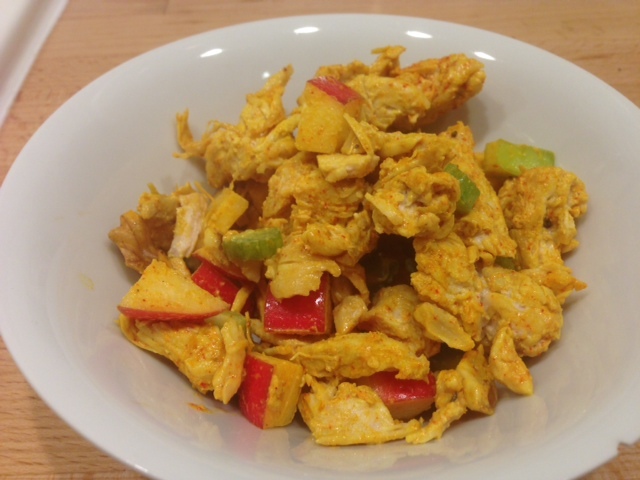 Why not simply sauté your chicken in a pan and create a colorful, flavorful and fun chicken salad! Having this chicken salad on hand for dinner with a beautiful green salad, on fresh bread as a sandwich, or on it’s own is a delicious way to oppose the status quo. Plus, leftovers make for a phenomenal lunch, and turmeric is said to be a great anti-inflammatory! 1. Prep the chicken: Dice chicken breast into cubes. Add olive oil to a medium pan. Once olive oil heats up, add chicken breast and cook, mixing from time to time. Add salt and pepper and cook until center is no longer pink, 10-12 minutes. 2. Prep raw ingredients: Rinse and dice your apple, celery and cut two wedges from your lemon. Smash walnuts. 3. Marry the two: Once chicken is fully cooked, place into a mixing bowl. Add in the vegenaise, paprika, turmeric and mix thoroughly. Sprinkle in your apple, celery and walnuts, mix thoroughly. Finish with a bright splash of lemon, season to taste with additional spices, or sea salt + pepper. Tastes great right away, but even better the next day!